The Todos Santos “Pueblo Magico” is inviting all to its 4th Mango Festival in the neighborhood of San Ignacio. Experience artistic and cultural events and activities related to mysterious mango. Witness the election of the Mango Princess of Todos Santos. Savor the flavor of the fresh, seasonal, local Mangos. Watch the beautiful local horses as they are gracefully handled by the Todos rancheros. The 2011 Festival will include anything and everything that has to do with Mangos, from songs and dances to food, art and Literature. Check this year’s new events, featuring Horse races, Kid’s Theater Play and Race Cars Show. The festival is sponsored by the Delegación de Todos Santos, the Municipio de la Paz and the Pueblo Mágico Committee. 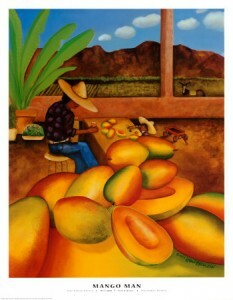 The 2nd Annual Mango took place July 30th in 2009 in downtown Todos Santos. In 2009 Author Lauren Klein presented her new book: “Mango: Peeled Apart to Find the Heart” . The event also featured live music with Dueto Los Flores and it was free to attend. In 2009 the Festival was in Honor of Prof. Esteban Perez Espinoza, an icon of the local community that recently passed away. If you missed the first Festival de Mangos de Todos Santos, don’t miss the 2009 Festival. Accomodations are still available at the CalyCanto Casitas. Go to www.CalyCanto.com. We’ll see you in Todos Santos!